1.Prepare Fish: Preheat oven to 350°. Spray rimmed baking pan with nonstick cooking spray. In wide, shallow dish, whisk egg whites until frothy. In separate wide, shallow dish, combine garlic, cornflake crumbs, parsley, basil, lemon pepper and lemon zest. 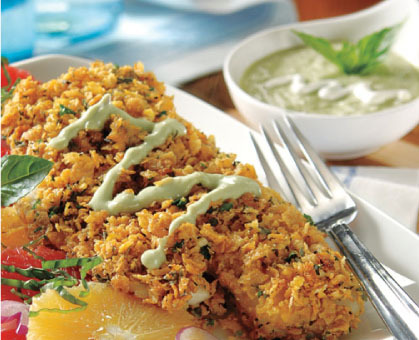 2.Dip each cod fillet in egg whites, then in cornflake crumb mixture, patting lightly so mixture adheres to both sides. Place cod on prepared baking pan. 3.Bake cod 15 to 20 minutes or until cod turns opaque throughout and reaches an internal temperature of at least 145°. 4.Meanwhile, prepare Avocado Sauce: In food processor with knife blade attached, blend all ingredients until mixture is well combined, scraping bowl occasionally with rubber spatula. 5.Squeeze juice from lemon over cod and serve with Avocado Sauce.